Can Hillsboro stay away from injuries to reach potential? 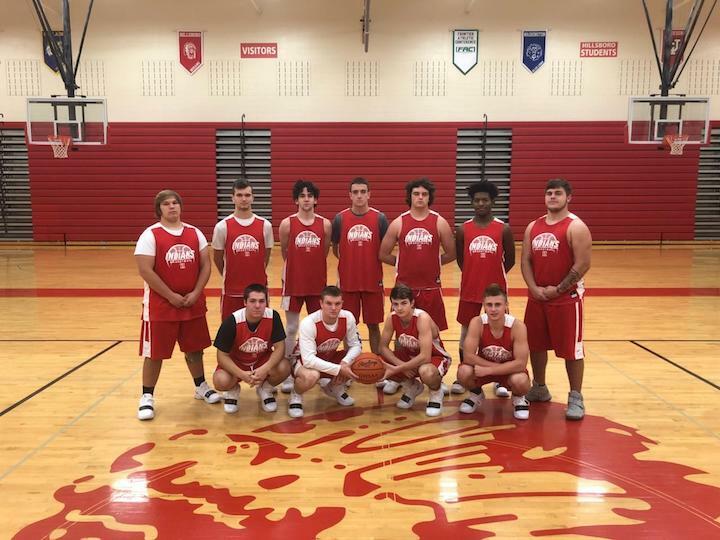 Having 11 players on their varsity roster for the upcoming 2018-19 season, the Hillsboro Indians want to avoid injuries that have hampered their past couple seasons, stay healthy and see what happens as they embark on a 22-game schedule. The Indians didn’t have the greatest of seasons one year ago, but injuries to their team while playing in the Frontier Athletic Conference left them at 3-7 in conference play as they were fourth in the FAC and 8-16 overall. Hillsboro does return three players who have played for three seasons with the Indians in Ethan Watson, Josh Keets and Mason Swayne, all of whom are seniors. Other seniors include Reece Bloomfield and Jared Thompson. Juniors are Luke Magulac, Silas Simmons and Gavin Temple. The three sophomores for the Indians are Brad Miller, Ryan Scott and Jakwon Clark. Watson averaged 13.7 points per game last season. In 22 regular-season games as a junior, Watson scored 301 points. Swayne returns as the point guard for HHS, averaging 6.8 ppg. last season in 22 games. Keets last season scored 104 points, averaging 10.4 ppg. for 10 games played. Clark played in 22 games one year ago and as a freshman averaged 4.7 ppg., including two games of double-figure scoring. For Hillsboro, the potential success of the season will come down to avoiding injuries. The past couple seasons have seen the Indians battle numerous injuries, hampering their seasons, as noted during last year when the Indians won their first four games, and then the injuries started to accumulate. Also for success to come for the Indians, they will have to add to their overall game as a team, according to their head coach. “The biggest thing for us, especially last year, was just staying healthy. We had a number of injuries last year. Our season got off to such a great start, and then we didn’t stay healthy,” Miles said. “I thought defensively, we improved. You can always improve defensively, but I thought we really made strides, and then we lost a couple key guys that really hurt us as far as the leadership that we lost. Hillsboro lost two strong players from their lineup last season in Philip Mycroft and Marshall Ward. In losing those two players, the trio of returning seniors will be looked at as the leaders of the team moving forward. Mycroft averaged 13.2 ppg. during his senior season. “From last season, we lost Philip Mycroft and Marshall Ward, two guys that had so much experience. Losing those two guys – we’ll miss those guys,” Miles said. “Mason Swayne has developed into one of our leaders. I’ve seen it in practice. His work ethic, what he did over the summer to improve – we’re looking for big things with Mason. Miles spoke about some of his other players as well. “We’re looking for our young kids to grow,” he said. “Ryan Scott, as a freshman last year, got a ton of minutes, especially midway through the season when we had some injuries. The work he’s put in over the summer to see his game get even better – he’s expanded his game, and he’s improved. As with every new season, the excitement is at a high level before the games begin, and that is no different for the Indians. Hillsboro will play two consecutive home games to start the year in the Ohio Valley Hoops Classic, which will be held at Hillsboro High School for the first time. “We need to have more days of practice to prepare because with Wilmington as our opener, we play one of the premier programs in our area with Coach [Michael] Noszka and what he’s done with that program,” Miles said. “We’re excited to be able to open up the season in the Ohio Valley Hoops Classic at our place. We have a wonderful facility, so we get to showcase how nice our facilities are. We feel like we have the best facilities around. On Saturday – the second day of the two-day tournament – Hillsboro will host St. Patrick at 6:40 p.m.
“We have a team from Kentucky that’s coming in St. Patrick, so it’s a big opportunity for us to see a school that we don’t see often and play another home game in front of the home crowd,” Miles said. The conference play for the Indians will be another challenge for the season as it is each and every year. Playing teams such as Chillicothe, Miami Trace, Washington, McClain and Jackson twice a season isn’t an easy task, but a challenge the Indians are looking forward to. “Our league is a very competitive league, with Chillicothe and the success they’ve had. Jackson returns a lot, and they’ve got some good young kids. McClain is traditionally a good opponent, with their program and with a new coach, to see what they bring with the new direction under Coach [Joe B.] Stewart,” Miles said. “Then there is obviously Washington Court House and they have a new coach [Connor Scott], and they’re extremely athletic. Miami Trace with Coach [Rob] Pittser, they lost their top two scorers, but they’re going to be competitive night-in and night-out. The non-conference schedule is just as strong for Hillsboro, as they should be battle-tested by the time the tournament rolls around in February. This year, the Indians will face Wilmington, St. Patrick (Ky.), Georgetown, Lynchburg-Clay, Fayetteville, Blanchester, Eastern Brown, Fairfield, Goshen, Western Brown, Adena and Paint Valley for their non-conference contests. “I know that this group of kids, we’ve got some guys that are tough. They’re tough kids,” Miles said. “They’ve played together for many years, they enjoy each other’s company. This is a tight-knit group. They’re a joy to coach each day in practice. They work hard. They care about the team and not themselves. I’m just excited about the locker room in general with the kids we have. It’s a very enjoyable group to coach. The Indians open the season at home vs. Wilmington at the 2018 Ohio Valley Hoops Classic at HHS with a 7:30 p.m. start.